This book is very inspiring to my whole intention for this blog. 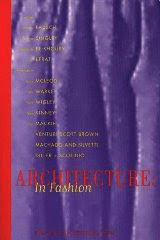 Although the essays in this book speak mostly about western architecture and its relationship to western fashion, the theories are still applicable. There are numerous quotes from this book which continue to inspire me and will be the premise for many of my future posts.